Now that some spring migrators are in town, we’ve occasionally seen new birds at our feeder. Recently this bright yellow fellow was dining leisurely enough that I could capture him. 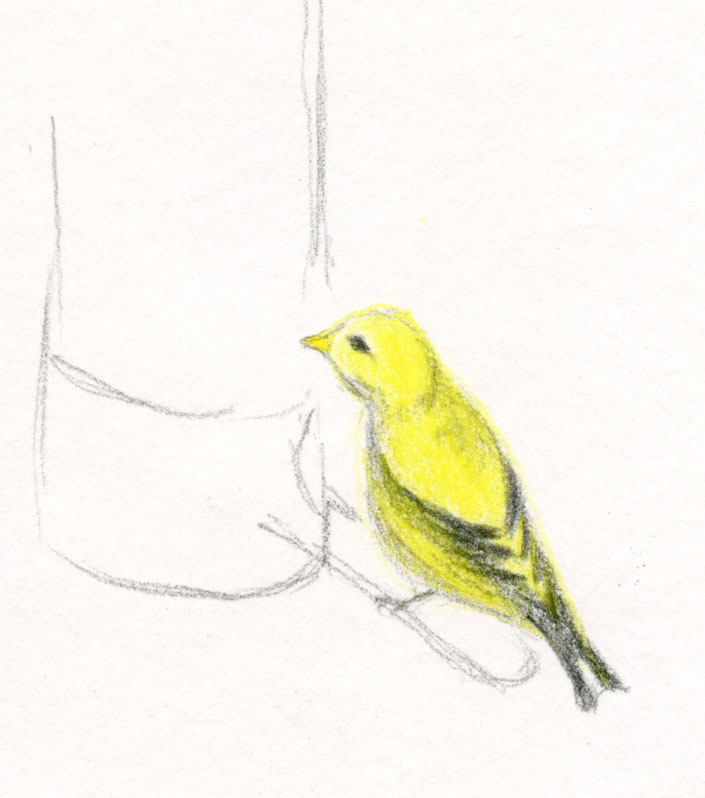 With that hue, I thought it could be an American goldfinch (our state bird, though I rarely see it), but the one I saw and sketched did not have a black head. The black markings on his wings formed a chevron in the same way that they do on a pine siskin. In fact, I’ve sketched a male pine siskin with some yellow, but I’ve never seen one this bright. I couldn’t find anything quite like it in my bird ID books. Edited 3/27/18: ID’d by Alex MacKenzie as a female American goldfinch! Female American Goldfinch. Females lack the black cap. Nice rendering! Alex, I think you're right! My book shows only the male (of course ;-) ). Thanks! Maybe a tanager? I have seen one passing through at this time of year occasionally. Bright yellow and no black cap, but I am not sure about the wing markings. I looked that up too, but I think Alex is right -- female goldfinch. The tanager would have black all the way up the back. They're also bigger than a finch if you have any other birds to compare size to. I love goldfinches and used to see a lot of them when I had my feeders up, lovely birds and of course, the American Goldfinch is our State bird!